A few weeks ago, I saw Sarah Weddington sitting at a restaurant. I might have been the only one in the place who recognized who she was, but I can guarantee you, that woman had more to do with the past, present and future of reproductive rights than anybody else in the room. Sitting at that table was the woman who argued Roe Vs. Wade in 1973 – and won. Sitting at that table was the woman who made abortion legal in the United States. She secured a future for women that was safe, respectable and compassionate. She welcomed women out of the corners, dirty hotel rooms and back alleys, and into safe, clean and state-inspected facilities. She emphasized the words Privacy and Choice in front of the Supreme Court and made sure women and families have both, when it comes to their own medical decisions. 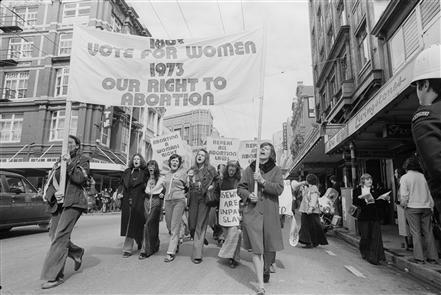 39 years ago, and even before that when it was illegal, women were helping women obtain abortions, whether it was by raising funds for them to travel to a place where it was safe, spreading knowledge of who and where to go to, or even how to end a pregnancy at home… It was around the early 70s that women like Merle Hoffman began founding clinics specifically for women who were backed into this corner, and now there are over 600 providers in the United States. Roe V. Wade is getting older, and it’s unfortunately not aging so well. Flat out: There are people that want to reverse the Roe V. Wade decision and make abortion illegal. Still. They want to be able to take your personal decision – maybe the one you’re even making right now – and make it for you. They want to be able to tell you when, how, who, why and where you’ll be able to get an abortion. They want to make it expensive for you. They’d really love it if there were no option but for us to go back to having to share secrets, use extremely unsafe methods to induce abortion, raise funds for travel, or just plain give up and have a child, no matter how we might feel about it, or how prepared we are. Well, we’re not stepping backwards. We’ll give each other ultrasounds at their command, we’ll turn abortion into a 2-day procedure, we’ll say what they want us to say, but they will ultimately never – ever – make abortion illegal for us again. Not on our watch. At it’s core, abortion care has always been about women helping women in need. If you’ve been a patient of ours, if you will be a patient of ours or if you just like what we do, help us by standing with us for abortion rights – for your rights. Join the fight yourself. Honor Roe V. Wade, Sarah Weddington, Merle Hoffman, and the ladies that still fight for us daily by donating, volunteering, talking about it with a friend, sharing your abortion story, showing support to the woman who has one, sharing your thoughts on Facebook, Twitter or your own blog, or just simply thinking about what the world would be like, if we lost this right. Let’s not just appreciate what we have while we have it – let’s keep working to ensure that it’s ours to keep, forever.